FEMA requires all new and improved buildings located within a Special Flood Hazard Area to be properly elevated. An Elevation Certificate documents key elevations of a building. It must be certified by a licensed surveyor, engineer, or architect. The certificate is used by the National Flood Insurance Program to demonstrate compliance with floodplain management ordinances and to determine the proper insurance premium rate. To complete the Elevation Certificate, we will survey the elevations of each building level including the lowest horizontal structural members and the nearby ground. We will also photograph the building and identify the FEMA flood zone designation. Once the survey is completed, the Elevation Certificate form is completed and certified by our licensed professional staff. The work can typically be completed within a week or two. The cost is dependent on several factors unique to each property and typically ranges from about $500 to $1,000. If the Elevation Certificate verifies that your property is above the Base Flood Elevation, you can have it officially removed from the SFHA with a Letter of Map Change. A Letter of Map Change (LOMC) is a document that officially removes the property and/or structure from the Special Flood Hazard Area (SFHA). Property owners may then be able to convert their existing policy, using the premiums already paid for that policy, to a lower-cost Preferred Risk Policy (PRP), which is available for structures located outside the SFHA. If the lending institution agrees to waive the flood insurance purchase requirement for a structure, the property owner may be eligible for a full refund of the premium paid for the current policy year. Because of limitations of scale or topographic definition of the source maps used to prepare a Flood Insurance Rate Map (FIRM), small areas may be inadvertently shown within a SFHA on a FIRM even though the property is above the Base Flood Elevation (BFE). Therefore, FEMA established administrative procedures to change the designation for these properties on the FIRM. If a LOMC is supported by the Elevation Certificate, NE&C will prepare a Letter of Map Change request. Letter of Map Amendment (LOMA): A letter from FEMA stating that an existing structure or parcel of land that has not been elevated by fill (natural grade) would not be inundated by the base flood. For a LOMA to be issued by FEMA the lowest ground touching the structure, for a single structure, or the lowest point on the lot(s), for an entire lot, must be at or above the BFE. Conditional Letter of Map Amendment (CLOMA): A letter from FEMA stating that a proposed structure that is not to be elevated by fill (natural grade) would not be inundated by the base flood if built as proposed. Conditional Letter of Map Revision – Fill (CLOMR-F): A letter from FEMA stating that a parcel of land or proposed structure that will be elevated by fill would not be inundated by the base flood if fill is placed on the parcel as proposed or the structure is built as proposed. Letter of Map Revision (LOMR): A letter from FEMA officially revising the current FIRM to show changes to floodplains, floodways, or flood elevations. Conditional Letter of Map Revision (CLOMR): A letter from FEMA commenting on whether a proposed project, if built as proposed, would meet minimum standards or proposed hydrology changes. Whether you are planning to construct a new building in a SFHA or elevate an existing one, NE&C will work closely with your architect to ensure the structural integrity of the building. Elevating a building a few feet above legally mandated heights has very little effect on its overall look, yet it can lead to substantial reductions in flood insurance, significantly decrease the chances the building will be damaged by storms and flooding, and help protect against sea level rise. Freeboard helps protect buildings from storms larger than those that FIRMs are based on, provides an added margin of safety to address the flood modeling and mapping uncertainties associated with FIRMs, and helps keep structures above floodwaters as storm surge elevations increase with sea level rise. 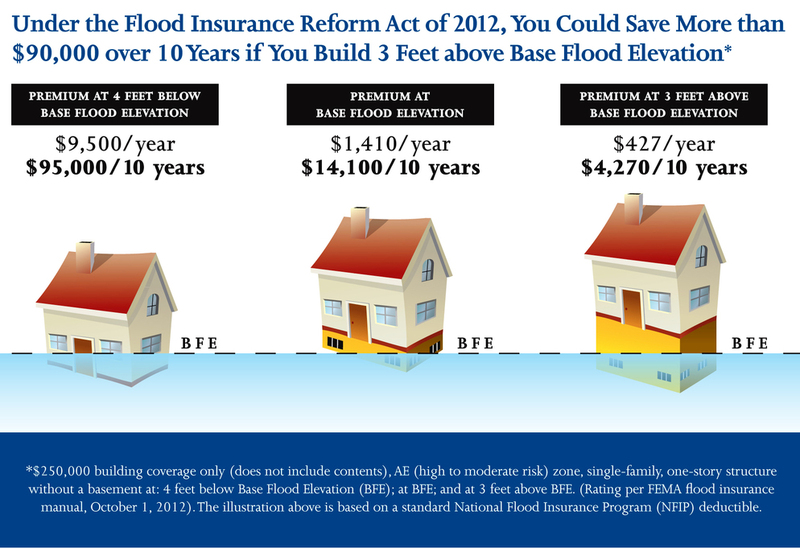 Recognizing that freeboard reduces flood risk, FEMA provides substantial (sometimes more than 50 percent) reductions in flood insurance premiums for structures incorporating freeboard. These savings can rapidly accumulate, especially over the life of a normal mortgage. Buildings on piers or posts have been designed to be supported at identified load-bearing points that are accessible from above ground. They are not typically constructed with brick veneer, stone or concrete blocks and do not usually have fireplaces and other hard-to lift components. Therefore, elevating them is relatively easy, in comparison with raising structures built on slab. It is most common to lift the floor, walls and roof as a unit and add a new foundation. The roof can be removed, a second story added (forming the new first floor) and the roof replaced. 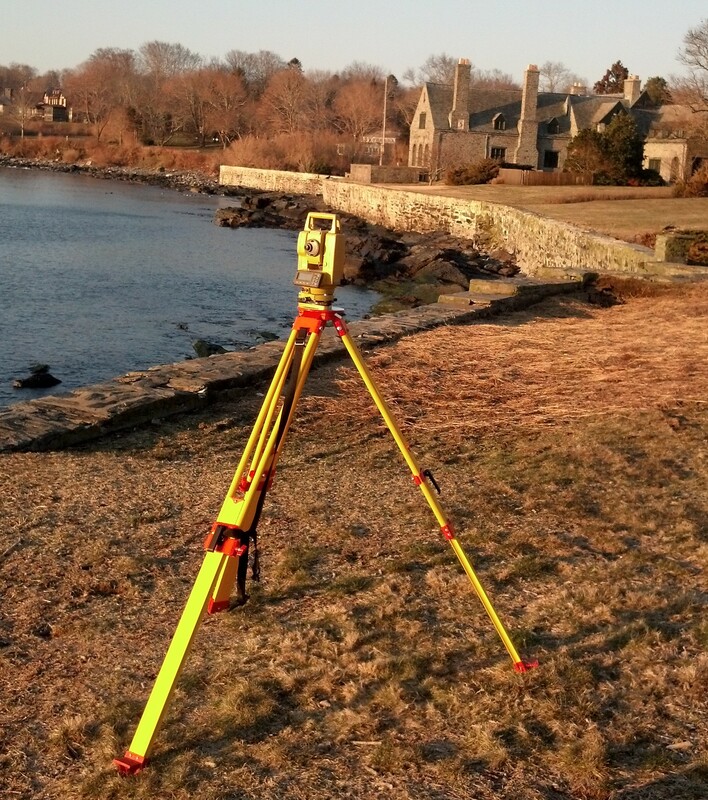 All of these methods assume that the original slab and existing pilings are capable of supporting the weight and increased wind loading of the added foundation and/or walls. This will need to be verified by an engineer, and some improvements may be required before lifting can begin. Construction in a Special Flood Hazard Area typically requires a permit from either the Coastal Resource Management Council (CRMC) if the property is near the coast or the Rhode Island Department of Environmental Management (RIDEM) if the property is near freshwater wetlands. NE&C will prepare the drawings and documents necessary to obtain the appropriate permit. Contact us for more information. Back to Top”.